In case you haven't heard, Baby K is here, and HE is named Eli Robert Kleinmeyer! We welcomed Eli on Thursday, February 23rd at 4:08 pm, and we couldn't be more in love with him. I'm so excited to record his birth story, both for my own memory and for those of you who like to read these sort of things. 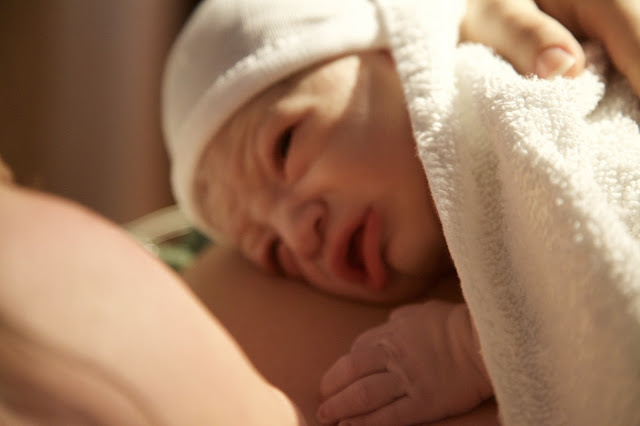 Giving birth was the most incredible, challenging experience, and though it was originally one of the reasons I was afraid to have a baby, I look at him and know I'd do it again in a heartbeat. Sometimes I honestly can't believe that our little guy is here. 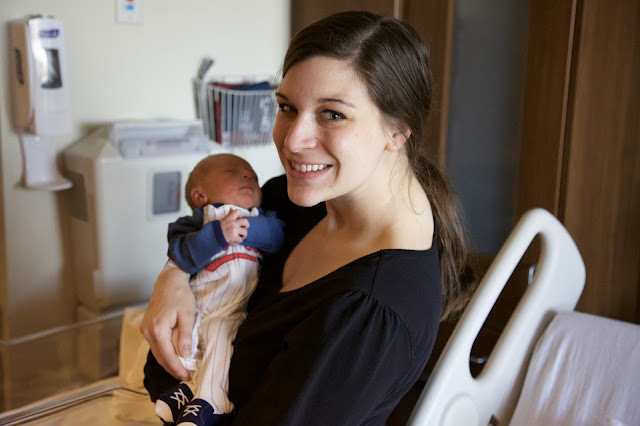 Here's the story of how sweet little Eli came into this world! On Tuesday, February 21st, I texted Aaron at school and told him not to freak out, but that I was having some mild contractions about ten minutes apart. I was uncomfortable that day at school, with the contractions continuing throughout the day, but I had a doctor's appointment that afternoon so I wasn't too worried. At the appointment, it turns out I was at a 1.5 and was about 90% effaced already. We were excited, and my doctor told me that she would see me the next week if I didn't have the baby before then. I knew most first time moms were late, but I also knew that this little one had been head down and ready to go for quite some time. Wednesday came and the contractions had stopped. We went to work as normal, but because of the Tuesday contractions, I was a little more aware of things we should be doing just because: installing the car seat, making sure stuff was somewhat in order at school, and having most of a hospital bag packed. Looking back now, it sure was a good thing we did! We went to church for our weekly Conversations dinner and shared our dating story with the Youth that night. Then, at around 11:40 pm, I woke up and told Aaron this was the real deal. Aaron ran some water in the bathtub and I labored in there from 11:40 pm to about 2:20 am. Aaron recorded my contractions, which were about five minutes apart right away. I listened to my Pain with a Purpose labor playlist, Aaron timed and packed the hospital bag in between contractions, and we realized we were about to be parents! Once I'd been consistently at four minutes apart, we headed off to the hospital. I was measuring at a 3, but when they checked me again two hours later, I really hadn't progressed. The nurse said we could stay and they would check me again two hours later, or we could go home and come back. I hated the idea of getting back in the car for contractions (it's the worst! ), and I didn't want to eat, but I also didn't want to be at the hospital forever. We'd also been up and I'd been laboring for about six and a half hours already, with basically no sleep the night before. We drove home and Aaron suggested that I call my mom to come to our house and sit with me while he took a quick nap so he could help me through the rest of labor. My mom showed up and was a complete champ. She really helped me breathe through my contractions and held my hand (which I kind of crushed hers with) for hours. She and Aaron timed me for a few more hours, and when I felt like I could push we knew it was time to head back to the hospital. The drive there was horrible, but I was already at a 7.5 once we arrived, and was at an 8 shortly after. Even though I had been terrified at the idea of getting an IV and all the other things I would have to do, I didn't even notice any of it in the moment. They checked my blood platelets, which had actually gone up a little- which meant that an epidural was an option. Again, I thought the idea of one would terrify me, but in the moment I had been laboring about 14 hours at this point and knew that I would still have to get to a 10 and then push as well. 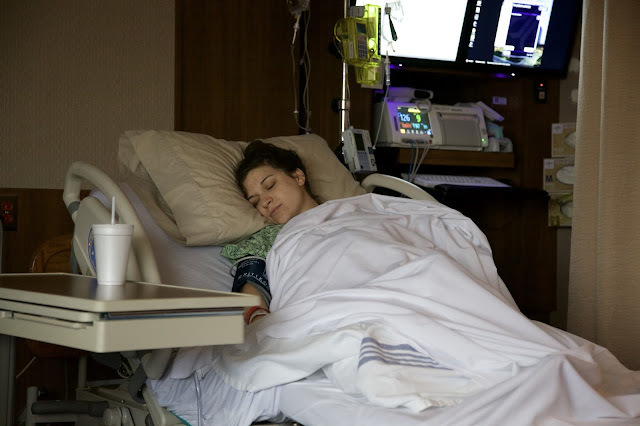 I hadn't committed fully to having an epidural or not, but both my doctor and Aaron thought it would be a good idea for me to relax a little and rest before pushing. I agreed, and it was the best decision I could ever have made (and wasn't freaky at all). A short while later, I was laughing and joking and asking, "Was that a contraction?" 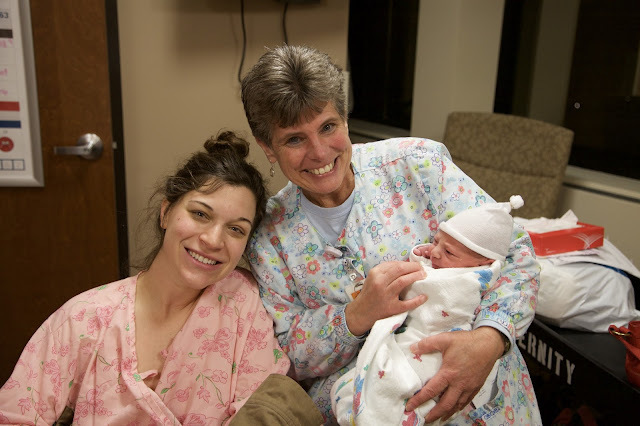 The smiling photo above was definitely after the epidural kicked in. I even had time to rest and listen to my music, knowing that our baby was only a few pushes away. I was ready to push at about 3:15, and my nurse Michelle (who was absolutely incredible) told me that I was having this baby on her shift! Since I'd had a little rest from the epidural, I felt invigorated, strong, and ready to push Baby K out. My mom and Aaron helped me on each side, and everyone was so excited and encouraging that I just knew we were almost there. With one more push, our baby was born at 4:08 pm. Aaron got to tell me that it was a boy, and we told everyone that he was named Eli Robert. Both my mom and Aaron were able to capture some photos and video, and I love that we captured this most amazing moment. And yes, we all cried. Eli was 7 pounds and 20.5 inches. He has long feet and a darker complexion like his mama. We are so in love with our little guy. We spent an hour together as a family of three, and then all of Eli's Grandparents, Uncles, and Great-Grandma came in to meet him. I got to eat my first meal, 54th Street of course, and just bask in the joy of knowing that we had a son! I'll never forget those first few moments of looking into his eyes. Before we went up to the Mom and Baby Floor, we had to take a picture with our incredible nurse, Michelle. God was so good to us throughout this entire pregnancy, and Aaron and I truly felt that we had the best nurses, doctors, and staff around to help me bring little Eli into the world ten days early (and then figure out how to take care of him.) The Lord walked through my fears with me and helped them seem like nothing as this amazing team cared for me. I am so grateful for them all, and hope they are still around for our next baby- but I told them to give me a few years! All in all, it was a very smooth birth. I felt accomplished that I got to an 8 without any pain medication of any kind, but I was also so grateful for the chance to rest and have a little relief from the epidural when the time came. People always say that once you hold your little baby in your arms, nothing else matters and you kind of forget the rest. I didn't really believe them, but it's true. I remember thinking "That wasn't so bad. I'd do it again." And I would. Welcome to the world, sweet Eli. You are prized and precious. We love you so much, no matter what, and always will. For more pregnancy and motherhood posts, click here. Be sure to follow along with our journey on Instagram and Facebook! Congratulations on having a beautiful baby boy! My nurses were amazing during my first delivery, which was horrible, and I wish I could go back and let them know that. I gave birth at 7:18 am and the nurses, in the hospital I was delivering, went on strike at 7 am. New nurses were brought in, but some of my nurses were refusing to leave, because they had been with me the whole time I had been pushing (4 hours). We had to make them leave so they wouldn't be kicked out of the union! It is incredible how quick you forget the pain! I swore I would never have another child, after my experience the first time, but I went on to have 3 more! Thanks so much! Oh dang, that sounds crazy!! Four hours of pushing? You are a trooper! Thank you so much! It was such a joy! 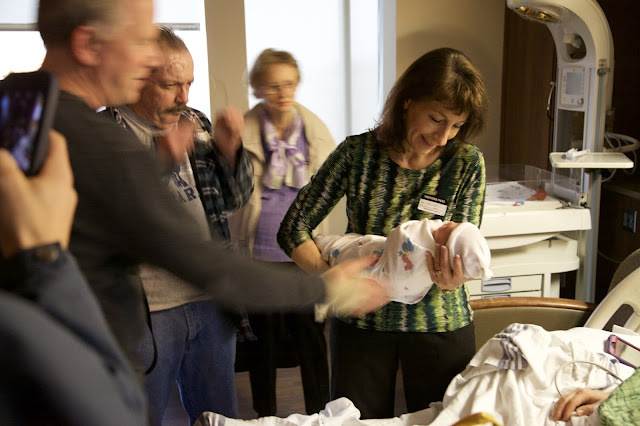 I love reading birth stories! I'm so happy for y'all! Like you, I think the epidural right before pushing, which allowed me to rest after laboring with very little sleep, was the best decision. I can't wait to watch this little guy grow up! It was the best for sure :) Thanks for being a part of my electronic village! Oh that is so sweet! Wow, 13 days late! Hard for me to imagine. Thanks so much! I'll just be over here crying if you need me. ;) Such a sweet story! I am so happy for y'all! Eli is the cutest little guy and y'all are amazing parents! Way to go, mama! Aww, thanks so much! 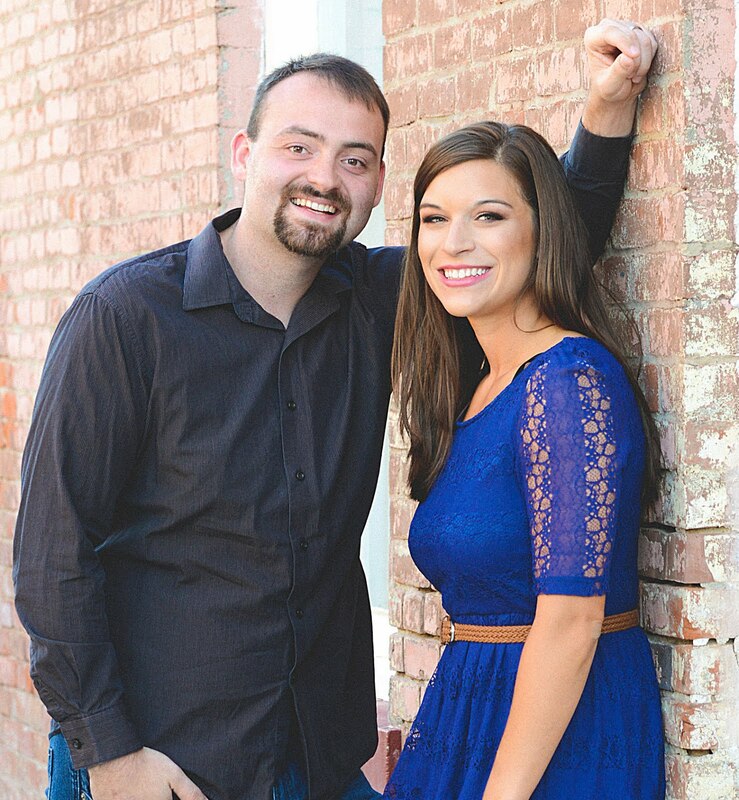 Your story will be here before you know it, along with sweet Selah! Congratulations! I love the name. If I ever have kids, Eli is a name that would be on my list. :) I love that last picture of the three of you. You have a beautiful family! Thank you so much! That's one of my absolute favorites as well! Congratulations!!! He's so beautiful, and such a wonderful birth story. I also had an epidural, but it didn't work the first time, only numbing one side of my body. Luckily, it worked the second time. Your pictures are so beautiful. Enjoy your newborn! Thanks so much, Shann! That would stink if it didn't work fully. We are so in love with him. Congrats!!! This is such a special story, he is such a cutie!! I can't wait for many more posts! Congratulations, he is such a cutie! It was really great! I love reading them too. Thank you so much! That is so awesome, we need good people in those roles. Thanks for reading! I have tears in my eyes! I'm going to read your story about being scared to have a baby, because that's where I'm at right now, and so I read beautiful stories like this to help me remember that millions of women have gone through this before me and have been FINE (and look what the result is!!). Congratulations, and thanks for sharing with us!! Awww, yay! I'm seriously so happy that you found the blog and are going to go check out the other post- I definitely have seen the ways that we can overcome these fears and how worth it everything is in the end!! This is so exciting! I am expecting in late June and your post really eased some of my anxiety about the fears I have going into labor! Aww yay!! You can do it, mama. Don't be afraid! Congratulations on your beautiful, healthy baby boy! Oh the joys he will bring to your life. Thank you so much! I couldn't agree more! Thanks so much! I wasn't sure what I thought about one, but in the moment it was perfect and I didn't feel like any less of a mama! There truly is a happy medium, and we don't need to shame mamas for the way they did their birth. Congratulations! Glad to hear it went well for you all. Thanks so much, Cassie! It did go well. You are getting so close! Congratulations on your new baby boy!! What a sweet blessing. Get some rest and enjoy the newborn days! They grow up so quickly. Thank you so much! We are getting spoiled because he's been sleeping 5-6 hours at a time at night! Congrats mama! Eli is beautiful. 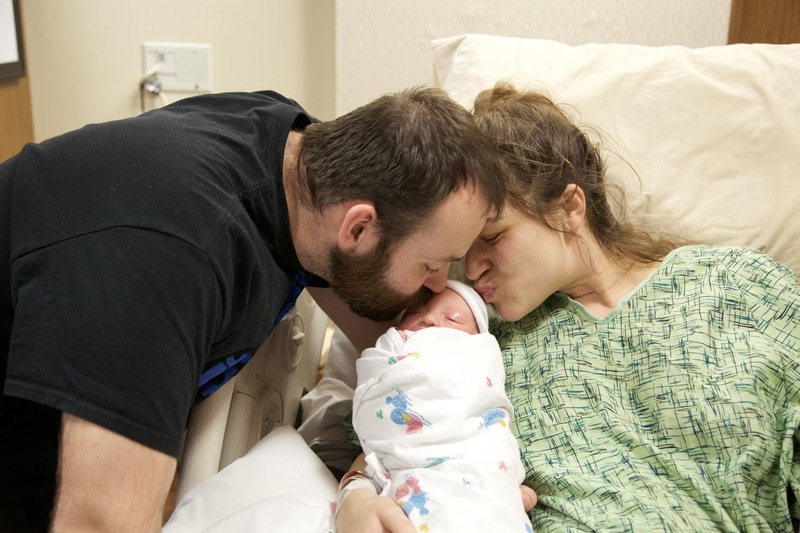 Thank you for sharing your birth story!